This is the first in a series of Friday posts about apps or websites I find interesting, useful, and maybe even fun. I hope you will return here often to see what I am sharing and to perhaps share YOUR ideas as a comment or in an email to me. 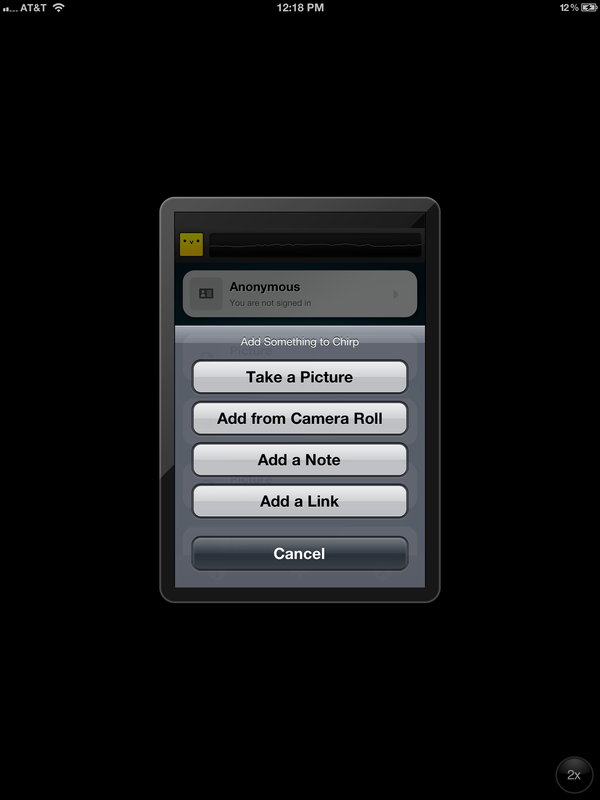 When you are using iOS devices in the classroom with students, or working with a group of teachers, sometimes sharing a link or an image with the group can be a challenge. What if your iPad (or other iOS device) could “sing” a technical bird song, and the learners’ devices could “listen” and receive the link or image instantly? Sound like magic? It’s not, it’s a free app called “Chirp.” Chirp is an app that uses sound to send information between devices. You can easily send an image, a link, or 140 characters of text from your iPhone, iPod Touch or iPad to another iPhone, iPod Touch or iPad. Your device sends the information to every device running Chirp that can “hear” the electronic bird-like 2-second chirp emitted by this app. So imagine you want to send a link to your class. Tell them you are going to Chirp-it and they open the app and you chirp the link and they all receive it at the same time. Or imagine calling someone on a landline and “chirping” an image or link to them over the landline to their mobile device with the Chirp App running and “listening” to the phone call. This is not one-directional… students can Chirp ideas or pictures to others as well which means students can capture a screenshot of their device and share it with everyone, or you can share an image as a writing prompt and the students will have it in their hands to work with without a projector or other setup. Chirp can work without wireless connectivity. The recipients’ devices will store the “incoming chirp” until they have online access at which time the device will download the information associated with the chirp. One of the best things? No sign-up, pairing or other technical steps are required, just install the app and start Chirping! This app falls into the category of file and information sharing. Unlike a QR Code which requires a camera and “line of sight”, chirp can communicate across a crowded room, a video conference, and even a podcast or audio broadcast…. It IS almost like magic! Compatible with iPhone 3GS, iPhone 4, iPhone 4S, iPod touch (3rd generation), iPod touch (4th generation) and iPad.Requires iOS 4.1 or later. I just want to tell you that I am beginner to weblog and absolutely loved your web-site. Probably I’m likely to bookmark your website . You surely come with outstanding articles and reviews. Thanks for sharing your website page.